The Chatswood Retina Service was founded in 1977 by Alex BL Hunyor, who was joined in practice by his mentor Edgar J (Eddie) Donaldson. At that time there was no comprehensive private retina service in Sydney. 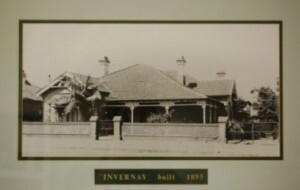 In 1983 the practice moved to the historic house Invernay (pictured) and in 2009 with the further growth of the practice, it moved to its current location in Thomas Street. Dr Donaldson was recognised as a pioneer of retinal surgery in Australia. After Alex founded the Sydney Eye Hospital Alumni Association, he introduced the Eddie Donaldson Memorial Lecture, and gave the inaugural lecture in 2002. The lecture chronicled Eddie’s many achievements and the history of the Retina Unit at Sydney Eye Hospital. A transcript of the inaugural lecture is available here. Retina Associates has grown to be one of the leading retinal services in Sydney with an ever-expanding number of fellowship trained retinal specialists and multiple office locations throughout Sydney. It is a fitting reflection of Alex’s prescient vision for retinal practice.